Pretoria News - 19 March 2013, DOCTORS from the University of Pretoria (UP) and University of KwaZulu-Natal (UKZN) have stepped up to the challenge of providing a clinical management casebook for health care workers treating patients with HIV and TB drug resistance. Drug resistance is one of the main challenges facing HIV and TB programmes in Africa. Dealing with these challenges requires an understanding of how drug resistance develops as well as up-to-date knowledge about diagnosing and managing patients. It is against this background that UP, in collaboration with the UKZN, Medical Research Council (MRC), the European Delegation and the Africa Centre for Health and Population Studies launched the HIV and TB Drug Resistance and Clinical Management Case Book. This book uses a case-based approach to present health care workers with the most important information needed to offer their patients the best possible care and improve their programmes to prevent the emergence and spread of drug resistance. It will help health care workers learn how drug resistance develops and which diagnostic tests can be used. The book is being published and funded by the MRC with grants from the European Delegation to South Africa, the US CDC/President's Emergency Plan For Aids Relief and the Wellcome Trust. Nearly 2 000 copies of the book are to be sent to health facilities. This book is part of the capacitybuilding programme of the Southern African Treatment Resistance Network (SATuRN), which has trained 1 650 clinicians, nurses and pharmacists in southern Africa at free workshops. Dr Tulio de Oliveira, a co-author of the book, director of SATuRN and senior researcher at the Africa Centre for Health and Population Studies, said the book was being published at an important time as the National Department of Health had expanded TB drug resistance testing to most of the facilities and planning to do the same for HIV drug resistance testing. Another co-author, Dr Richard Lessells, a researcher at the Africa Centre for Health and Population Studies, said the book would give health care workers an understanding of why HIV patients on ARVs failed to adhere to the medication. The vice-chancellor and principal of UP, Professor Cheryl de la Rey, acknowledged not only the authors and the work at Friday's launch, but also the partnership with the UKZN. She is an advocate of partnerships between universities which she said 'It will enhance the contribution of the academic proposition to our country and to the continent'. Professor Eric Buch, the dean of the Faculty of Health Sciences at UP, said the collaboration of the two institutions filled a void in dealing with the HIV and Aids and TB epidemics 'The challenge of the next decade is going to be drug resistance, and if we don't get that right, we are going to face a resurgence of HIV/Aids and tuberculosis that is going to overturn all the public health gains that we have achieved', he said. The book would ensure that patients received correct treatment, benefiting society as a whole due to a reduced number of infections, he said. 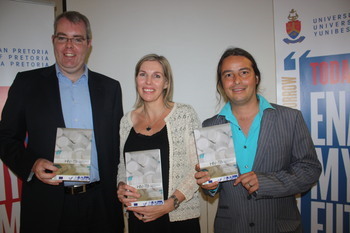 Authors of HIV and TB Drug Resistance and Clinical Management Case Book, from left, Dr Richard Lessells, Dr Theresa Rossouw and Dr Tulio de Oliveira. RegaDB: Community-driven data management and analysis for infectious diseases. Libin P, Beheydt G, Deforche K, Imbrechts S, Ferreira F, Van Laethem K, Theys K, Carvalho AP, Cavaco Silva J, Lapadula G, Torti P, Assel M, Wesner S, Snoeck J, Ruelle J, De Bel A, Lacor P, De Munter P, Van Wijngaerden E, Zazzi M, Kaiser R, Ayouba A, Peeters M, de Oliveira T, Alcantara L, Grossman Z, Sloot P, Otelea D, Paraschiv S, Boucher C, Camacho R, and Vandamme AM, Bioinformatics (2013), 29 (11):1477-1480, doi: 10.1093/bioinformatics/btst162 .